Postural support devices, constructed as additional components to wheelchair seating, are widely available. The selection or prescription of the most appropriate postural support device should be partially dependent on its ability to withstand static and repeated loads. The new wheelchair seating standards specify test methods for measuring a device's ability to withstand these forces. Tests involve mounting the device on a rigid test fixture to simulate a wheelchair, and applying forces to simulate normal usage. Belt is loaded to 50 Newton (N) force setup load. Blue marks are placed on the belt and the loading pad position is measured. Belt is cycled 1,000 times to the required load. Belt is relaxed for 30 minutes, then brought up to 50 N force setup load again. Blue marks and loading pad position are measured against their starting points, and the amount of movement�or slip�is recorded. 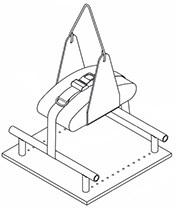 Belt is loaded to twice the repetitive load and the loading pad position is measured. The maximum allowable slip for both tests is 10mm. Typical slip for a Bodypoint belt is just 0-5mm. To a wheelchair user, a few millimeters can mean the difference between a safe, comfortably fitted belt, and one that rubs, aggravates, goes unused, or requires constant re-positioning.